First, we woke to the news that Farrah Fawcett had passed away after a battle with cancer. She seemed to be such a fighter and if you had the opportunity to see her documentary on NBC, you saw that aspect of her upclose. “Her big message to people is don’t give up, no matter what they say to you, keep fighting,” her friend Alana Stewart said. NBC estimated the May 15, 2009, broadcast drew nearly 9 million viewers. NBC later reported that her decision to tell her own story through the documentary was meant as an inspiration to others. The segments showing her cancer treatment, including trips to Germany for procedures there, were originally shot for a personal, family record, friends said. And although weak, she continued to show flashes of grit and good humor in the documentary. “I do not want to die of this disease. So I say to God, ‘It is seriously time for a miracle,”’ she said. That miracle was not meant to be. Then, later in the day, the unthinkable. While sitting at my day job (thankfully my day job is in advertising where these kinds of things intensely matter), I noticed something come across Twitter. 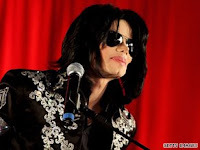 Someone had tweeted a TMZ report that Michael Jackson had been rushed to the hospital. Like most, I simply thought "another media stunt because he's not ready for his tour dates, yet". But the more tweets I saw and once major media was confirming the story, I realized that this was more than a media stunt. I was on TMZ, MSNBC, CNN and KTLA (CNN's Los Angeles affiliate) and was refreshing furiously in order to stay in the loop. Apparenly, I wasn't the only one since the surge in web traffic brought many sites to a halt. All of the sources were reporting different things. Some were reporting that he was in a coma, some were reporting that he was in great shape, while others were reporting the worst. Then, while on TMZ, I refreshed and saw the worst: Michael Jackson Dies. While I was shocked because I had grown up listening to Michael Jackson (his album "Off The Wall" was one of the first records I owned), I knew that I needed to wait until a credible source confirmed the story. It took what seemed like an eternity. Since I had lived in LA for years, I knew that if there was a credible network that was going to confirm the story first, it would be KTLA. I sat. I refreshed. I waited. CNN and MSNBC were still reporting that he was in a coma, while The New York Post and The Huffington Post both reported that Michael Jackson had passed but were still pointing to TMZ. While looking at the KTLA coverage, I actually spoke outloud to my computer monitor at one point: "Come on guys... confirm something, anything." Shortly after that, it was confirmed. First, by KTLA - then, by major networks and print sources. Michael Jackson had died at the age of 50. Even though his life was a swirl of chaos, calamity and drama that only worsened over the last 10-15 years, he was still a trail blazer in the world of entertainment. His songs, dancing, videos and persona were legendary. And it doesn't stop. Like most superstars whose light is extinguished far too early, his body of work and persona will now be more coveted and treasured than ever before. Although Michael Jackson was a superstar, he was still a person. His soul is finally at rest and should be at peace. I hope that he can finally find the peace that every member of the human family deserves in their passing. Tributes, funeral arrangments, court cases and the media coverage of all of it will continue for weeks, if not months, to come. So, for the time being, I doubt that peace will come - perhaps that's what the superstar in him would have wanted. As the media swirls around Michael Jackson's death, my hope is that the death of Farrah Fawcett isn't overshadowed. Her message of hope, courage, determination, and love of life in the face of terrible odds isn't the chaos that is the Jackson story. But, Farrah's Story is still a story that deserves to be heard and followed. Both Farrah Fawcett and Michael Jackson have left an incredible mark in the entertainment business. They will be greatly missed by family, friends and by the public.